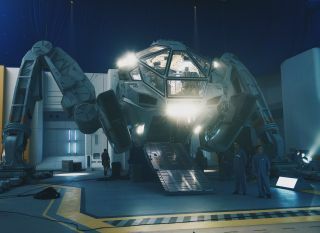 The moon tug on the set of "Independence Day: Resurgence." Note: This article contains minor spoilers for "Independence Day: Resurgence." A group of aliens bent on destroying humanity has returned to Earth in the movie "Independence Day: Resurgence," a sequel to the 1996 blockbuster "Independence Day." The new film, which is playing now in theaters, continues the story of the original movie and is packed with action, suspense, drama and — best of all — amazing spaceships! In the new movie, the once-defeated aliens have spent the past two decades mounting a comeback. Can Earth hold them off? We all remember the scene in the 1996 film when Capt. Steve Hiller (played by Will Smith) stands in his driveway and sees a ship called a City Destroyer, hovering over the nearby metropolis, blotting out most of the horizon. An alien ship descends to Earth. The spaceship is roughly the diameter of Jupiter's moon Europa: 3,000 miles (4,830 kilometers). This makes it large enough to have artificial gravity (which can be used to swoop up nearby ships or objects and throw them into a planet, as necessary). The spaceship also has a massive force field that can repel attacks. Once it lands on a planet, it can drill into a planet's core and shut down the magnetic field — in the movie, this deprives the planet of its atmosphere.In "Resurgence," the aliens arrive in a ship called the Harvester. It is many times larger than the City Destroyers. Thousands of aliens swarm inside the Harvester, including a huge queen alien, who serves as a point of collective intelligence. In the new movie, viewers learn that about three dozen of these spaceships attacked Earth back in 1996. One of them touched down in the (fictional) National Republic of Umbutu in Africa, where locals attacked the aliens to stop them from drilling into the Earth. The spaceships have remained dormant for two decades, but in 2016, they are inexplicably reactivated. Scientists visit the wreckage of a downed alien ship in the new movie "Independence Day: Resurgence." Reluctantly, the Umbutus allow outside experts to investigate the spaceship for the first time. The group includes David Levinson (Jeff Goldblum), who helped destroy the mothership in the 1996 invasion. Levinson, who is now the director of the United Nations-led Earth Space Defense program, discovers that the City Destroyer is sending a distress signal to the Harvester. Once the aliens get to Earth, they can begin using fighter jets in individual combat against humans. First, they deploy the jets after the humans get close to the Harvester. These spacecraft are equipped with "fusion drives" — supposedly, fusion-powered engines — and are all networked back to the Harvester queen, who directs and deploys them. A plane and set props from "Independence Day: Resurgence." Just prior to the 2016 attack on Earth, a sphere of alien origin approaches Earth's moon. Humans at the Earth Space Defense station on the moon decide to shoot it down as a precaution, even though it's not clear what the sphere is doing. The sphere crashes onto the lunar surface, and a search party decides to bring it to Nevada's Area 51 military station to learn more about its nature. After the first attack of 1996, humans stopped fighting each other and instead poured their military resources into protecting the Earth from aliens. The result is an Earth Space Defense system that stretches from Earth's orbit far out into the solar system. An alien attack over a major world capital. The first early warning location appears to be near Saturn. A military base stationed on Earth's moon monitors possible alien activity in the solar system, and is equipped with space tugs and is within easy reach of H-8 defender fighter jets that come from Earth. The last line of defense is two sets of satellites orbiting Earth. There are two constellations of satellites — one across latitude, and one across longitude — that have lasers capable of shooting at alien ships. The International Legacy Squadron is an elite fighter pilot group led by the son of Steve Hiller, Dylan Dubrow-Hiller (played by Jessie Usher). The squadron has H-8 defender fighter jets capable of fighting in Earth's atmosphere or in space, with the capacity to fly at least as far as the moon. They have fusion drives that are used only in space. Space tugs are cargo ships that are used mainly on the moon base, for carrying personnel and equipment. While they are not defensive ships, they can maneuver quickly. The tugs have robotic arms and hands that can be used to pick up and manipulate large objects. They also have fusion-drive capability.